Walibi Holland 2019 - Untamed: RMC Robin Hood : Theme Park News & Construction! Well it has finally been announced that Robin Hood, the Vekoma Wooden Coaster at Walibi Holland will close in 2018 for an RMC conversion! Spectacular news from Walibi Holland: the wooden coaster Robin Hood will be replaced next year. The amusement park will convert the classic eighteen year old rollercoaster into a state-of-the-art 'hybrid coaster', with wooden supports and a steel rail. That makes for a sensational ride full of heavy elements. "This is the dream of many amusement park fans in Europe", says Walibi director Mascha van Till to Looopings. "We are very happy that we can now make it known." Although the wooden construction will largely remain standing, Walibi provides a totally different ride experience. For the project, the amusement park in Biddinghuizen is working with the American roller coaster Rocky Mountain Construction (RMC). The firm specializes in building roller coasters that combine wood and steel. RMC coasters are known for very high speeds and inversions. Van Till was impressed by the hybrid coaster Iron Rattler in the American amusement park Six Flags Fiesta Texas. She still does not want to reveal how the replacement of Robin Hood will look exactly like. "The speed will naturally be a lot higher, the rest will be announced at a later stage." There will also be a new theme and a new name. In Europe there is only one roller coaster from RMC: the 56 meter high Wildfire in the Swedish amusement park Kolmården, opened in 2016. The top speed is 115 kilometers per hour. Robin Hood now goes 80 kilometers per hour. In September 2018, the first work will commence for the radical renovation. Until October visitors can take a ride in the current Robin Hood. The opening of the new roller coaster is expected to take place on 1 July 2019. Last edited by RCT3andNL2stuff on February 21st, 2018, 9:51 am, edited 1 time in total. Wow, who saw this coming? I certainly didn't, but I'm glad I visited Efteling on my day in The Netherlands last year so I'll have this to look forward to whenever I make it to Walibi. It'll be interesting to see RMC adapt another out & back layout. Storm Chaser is probably the closest they've done so far. So we have Nagashima and now Walibi scheduled for ibox conversions in 2019? Good start. I'm probably one of those few people who isn't immediately jumping with this news. It's very cool that the park is doing such a refurbishment to their current coasters. But seeing the amount of effort they've put into properly maintaining Robin Hood is kind of sad to see now. It was still running lovely and quite smooth, especially on a hot summers day the train was flying through the track! I'm really curious on the the proposed RMC layout. The ride is quite short so perhaps this could be the first RMC using the full original layout or maybe even lengthen it? I'm already guessing a roll drop after the original turnaround. Also with this overhaul I really hope the park is going to be smart and switch the entrance and exit sides of the station. Creating a fantastic pathway into the middle part of the ride. Possibly creating a new square with foodstalls and maybe even more flatrides? The official statement on Walibi Holland's website (Translated to English). WALIBI HOLLAND OPENS NEW ROLLER COASTER IN 2019! Biddinghuizen, 6 February 2018 - 1 July 2019, Walibi Holland opens the first hybrid roller coaster in Europe. The present wooden roller coaster Robin Hood is being rebuilt by supplier RMC into a roller coaster consisting of a combination of wood and steel. In September 2018 the American RMC and Walibi Holland started the renovation. In recent years, we worked hard on the plans for the renovation, with which Walibi Holland now comes out. Until October 2018, guests can still enjoy the current Robin Hood, after which they will be converted into a completely new roller coaster. In September of this year, the first work behind the scenes will start, says Maschio van Till, director. With the opening of the new roller coaster, Walibi Holland will open the third new attraction in four years. 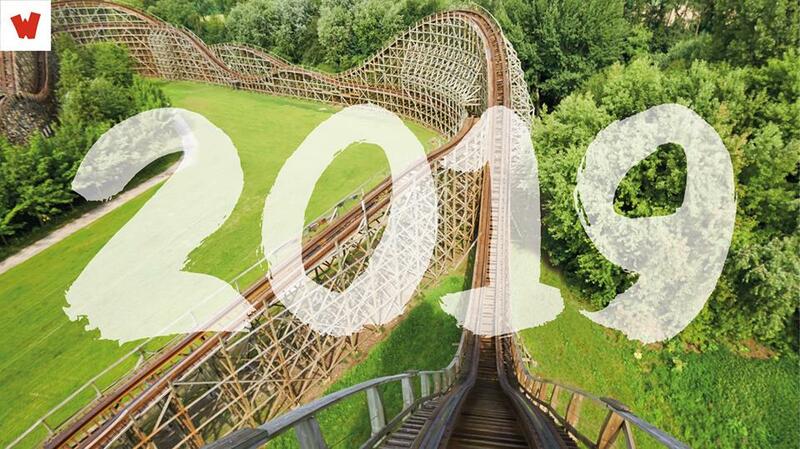 After the virtual reality experience NeuroGen in 2017 and the roller coaster Lost Gravity in 2016, Walibi Holland will again in 2019 with a new roller coaster. The opening of the new Robin Hood in 2019 coincides with other renovations in the area of ​​Sherwood Forest. In the coming years, a part of the park will be taken care of every winter, working on the Main street this winter. The different areas are thematized on the basis of a newly developed styleguide, under the name Festivalization. Walibi Holland will be opened next year from 30 March to 28 October. Stay informed via the social media channels of Walibi Holland. During the high season there are again various events such as #Lekkergaan where the park is open until 11 pm. For all information, check the website http://www.walibi.nl . Looking forwad to getting a ride on Robin Hood later this year and returning for the RMC conversion! Probably be my first RMC. It's always neat to see what they do with the layouts. Hurler and Georgia Cyclone were both out and back layouts. ^More like double or triple out and back. I'm hoping RMC builds up the first hill and makes it an airtime machine. I'm always underwhelmed when they overcomplicate things and much prefer when they just go for straightforward forces. This is part of the reason Storm Chaser is my favorite RMC from the ones I've been on. It doesn't screw around with stalls or wave turns; It just straight up tries to murder you and is fantastic for it. I agree slosprint, RMC tends to try way too hard when they don't have a lot of speed. Sometimes simpler is better because you have a chance to enjoy what's happening rather than being flung everywhere while moving fairly slowly. What a well-structured and content-filled argument. Consider me convinced. You did see the word "another" right? The point was that Storm Chaser's layout is closer to Robin Hood's than others they've done. I'm quite intrigued to see how they change the layout. I hope they don't end up pulling a Twisted Cyclone and taking out a lot of the ride. Cannot agree more, with a lot of straight air hills and maybe one stall, this could be one of the best, Storm Chaser is incredible since the fast wheels - and in my opinion is better than Wicked Cyclone. Let's hope they put an outerbanked airhill for the first hill and not an overbank... Excited to see this as I wasn't as impressed with Robin Hood as Dirk, I guess I picked a rough seat! From what I've heard, row 1, 2, 5, 8 and 11 are the "smoothest" rows. This is apparently because there are no wheels under (except row 1) these rows. From my own experience: Row 12 is the worst. For smooth riding experiences it's best to just avoid sitting above the wheels. Same rule goes for Bandit in MoviePark Germany. But then again, I like a more rougher woody so row 12 is my fave. I've heard a rumor that CDA wants to redo Loup Garou and Tonnerre de Zeus as well (somewhere around 2025), can anyone confirm this? Last edited by RCT3andNL2stuff on June 2nd, 2018, 5:22 am, edited 1 time in total. I've heard a rumor that CDA wants to redo Loup Garou and Tonnerre de Zeus as well, can anyone confirm this? I really don't think it will happen. RMC coasters are expensive and they got big projects for 2021 at Parc Astérix as well as at Walibi Belgium. They better not touch Tonnerre de Zeus. That ride is incredible. Tonnere de Zeus looks really good plz don't touch. I also still like Loop Garou... It's shakes a LOT but it's not really painfull. So I hope it's not true. Yes! Finally an RMC that I will likely get to ride! Walibi Holland Announces New "Mack" Ride for 2016!